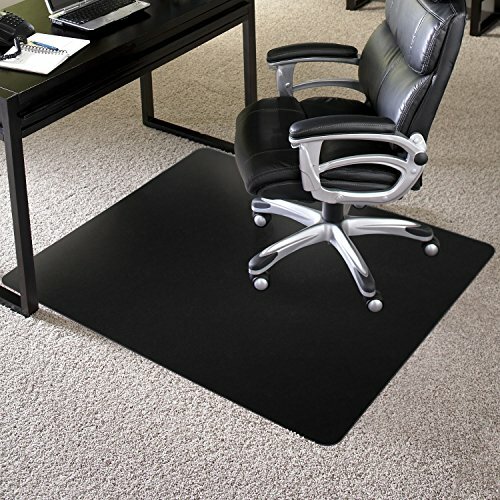 Our Black vinyl chair mat works best on low pile carpet with little to no pad. A Textured Top Surface for slip and scuff resistance. The exclusive AnchorBar cleat system makes chair mats less dangerous to handle. Using a series of staggered perpendicular bars, the cleat system "anchors" the mat as securely as traditional cleats yet are gentle on the carpet and fingers. Protects flooring from caster wear, spills and heavy traffic: also covers worn, damaged or stained flooring. The simplest color can make the strongest statement delivering a lasting professional appearance.